This week on “In Other Words” Bryony Schwan speaks with Missoula anthropologist Dr. Sally Thompson who returned this summer from a 40-day, “life-changing” journey to the Himalaya region of Northern India. Sally traveled with the Helena based Tibetan Children’s Education Foundation to learn firsthand about the local health care needs in remote regions of Zanskar. Sally was particularly interested in traditional healing practices and the challenges facing these healers, or amchis. While there Sally attended two multi-day teachings with the 14th Dalai Lama in Zanskar and Ladakh. 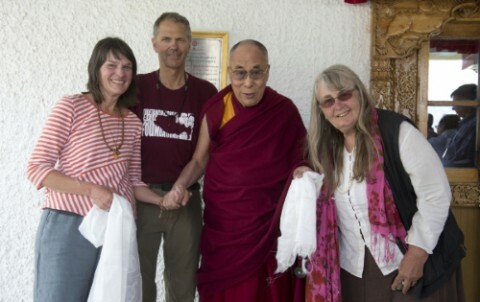 In addition to the trek through Zanskar, Sally and her colleagues spent a week in Dharamsala, the seat of the Tibetan government-in-exile. While there they met with the Prime Minister; the team at Gu Chu Sum an organization that serves formers political prisoners and their families; and the Nechung Medium, the Official State Oracle of Tibet. In her interview Sally talks about her fascinating experiences in Northern India and reflects on how her experience working with Native American communities in Montana has shaped her work. If you are interested in learning more about Sally Thompson and her trip you can email her at: oldtrails(AT)gmail.com. This interview aired September 16, 2014 on Montana Public Radio.